Once you have learned to play voicings of the major ii-V-I progression in all keys (as shown in Root systems, Part 1), and learned to outline ii V Is in all keys with scales (as shown in Root systems, Part 2), a possible next step is to learn a tune that includes a melodic pattern based on the root position voicing of the ii V I progression, and then learn that melodic pattern in all twelve keys. For players who are newer to jazz, I would suggest learning Thelonious Monk’s ‘Round Midnight’ or Bill Evans’ ‘Peri’s Scope’, both of which can be found in The Real Book Sixth Edition from Hal Leonard. (There is an interesting video by Brazilian bassist Marcos Roberto de Santos that matches a transcribed score of the original version of ‘Peri’s Scope’ with MIDI tracks of the piano and drum parts and a live performance of the bass part. As the piano part is notated in grand staff, it is helpful in understanding Evans’ style. The history of recorded versions of ‘Round Midnight’ is, to me, a fascinating jazz mystery: in the two best-known recorded versions of ‘Round Midnight’, by Monk and Miles Davis, the chord progressions used match neither the other recording nor the most common published charts of the tune.) Two other tunes that use root position melodic patterns are Duke Ellington and Billy Strayhorn’s ‘Dancers In Love’ and Billy Taylor’s ‘Radioactivity’; scores of these pieces are somewhat harder to find. Finally, John Coltrane’s ’26-2’ uses a root position ii-V-I pattern in its bridge. This tune, which involves his ‘Giant Steps’ changes interpolated into the form of Charlie Parker’s ‘Confirmation’, is among the most challenging of Coltrane’s compositions. With jazz improvisation, as with any language, it is always a potential hazard to focus too much on learning individual phrases without learning the grammar and vocabulary (or, in music, scales and arpeggios) that allow you to use phrases in context. While practicing hands-together chords as shown above is helpful before learning a root-position-based lick in all twelve keys, mastering the scale outlines of the major ii-V-I in the previous post is an absolutely crucial step. At the end of this post are five different ii-V-I patterns which, to my mind, are based on root position voicings. These five patterns boil down to three basic melodic shapes: the first two pairs of patterns are variations on the same basic lick, and the last pattern (from Billy Taylor’s tune ‘Radioactivity’) is a variation on a lick from a Charlie Parker solo. 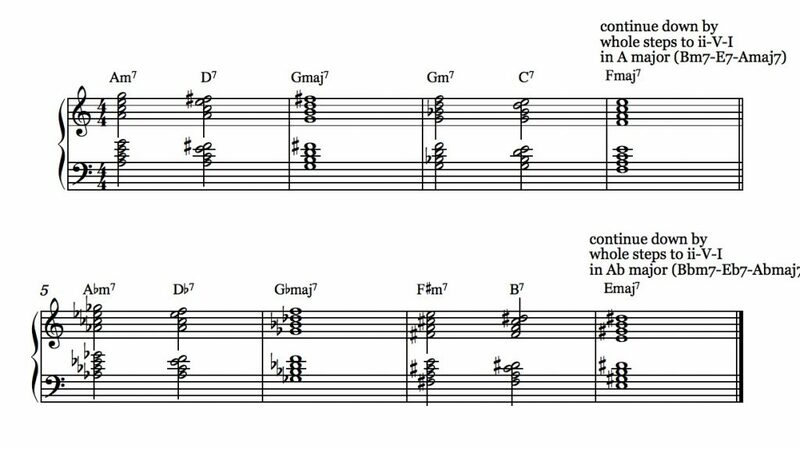 The pattern from ‘Round Midnight’ is one of the main motives that Monk’s tune is based on; it occurs in two different transpositions during the first A section. (In the version of the ‘Round Midnight’ pattern shown below, I have changed the first four notes from sixteenths to eighths, as the other patterns on the page are based in eighth notes.) John Coltrane performed ‘Round Midnight’ between 1955 and ’57 in the Miles Davis Quintet and with Thelonious Monk, so it makes sense that one of the tune’s foundational five-note patterns shows up both at the beginning of his solo on Giant Steps (recorded in 1959) and that the bridge of ’26-2’ (from Coltrane’s Sound, recorded in 1960) contains an expansion of the pattern. 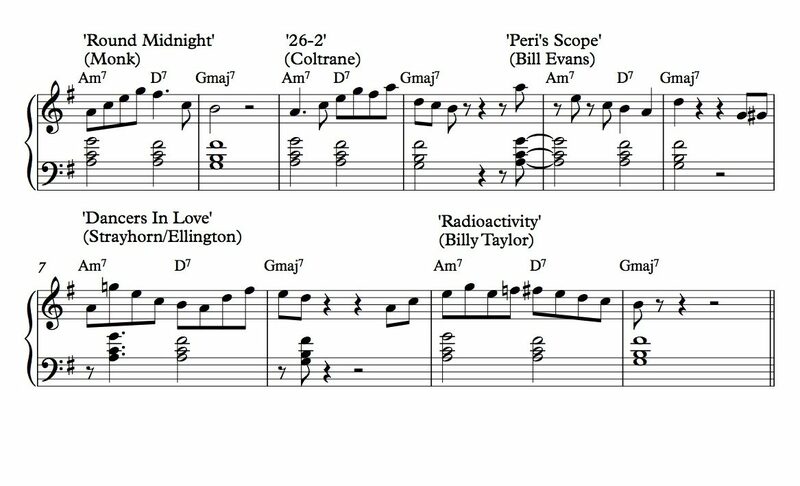 The pattern from m. 16-18 of the head to Bill Evans’ ‘Peri’s Scope’ is played a number of different ways by Evans; the right hand melodic phrase shown below can be heard on the head out of the original version from Portrait In Jazz, and the left hand chording shown is based on the live 1972 version. Note that the pickup to the phrase, which in the context of the tune anticipates the min7 change, is accompanied by an anticipated chord in the left hand. It is important to be able to accompany melodic anticipation in a bop line with this kind of harmonic anticipation, as playing all the chords on downbeats will contradict the line’s rhythmic energy. The opening phrase from Ellington and Strayhorn’s ‘Dancers In Love’ uses a six-note motive similar to the ‘Peri’s Scope’ phrase, but with a different rhythmic placement and a three-note chromatic run preceding it. The rhythm shown below for the left hand comping is Ellington’s original left hand rhythm, emphasizing the ‘and’ of one in both measures. A similar phrase is also used multiple times by Charlie Rouse in his tenor sax solo on Thelonious Monk’s ‘Ugly Beauty’. Like Thelonious Monk’s solo on Bags’ Groove (from Miles Davis and the Modern Jazz Giants) and Sonny Rollins’ solo on St. Thomas, Rouse’s solo is a model of ingeniously varied use of a single motive. Finally, one way to explain the main motive of Billy Taylor’s ‘Radioactivity’ is that it is based on a melodically condensed and rhythmically extended variation on the lick Charlie Parker plays in double time at the end of his second chorus on ‘Billie’s Bounce’ (around 1:10 on the linked video).